The impact of the orange wave in Alberta still continues. 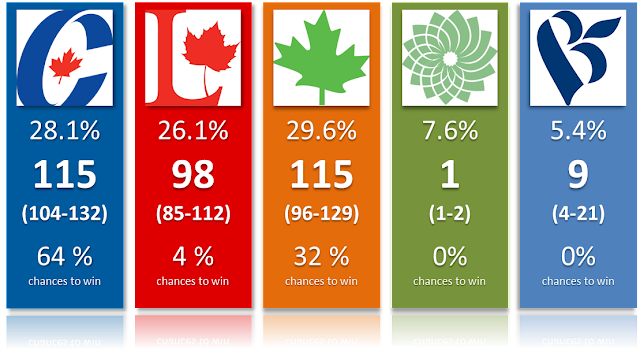 The most recent Ekos poll actually shows the NDP of Thomas Mulcair first Canada wide. This party is enjoying a significant boost in Ontario, Alberta and BC (but surprisingly not Quebec, as opposed to the most recent Crop). This is obviously only one poll, but there is no denying the NDP is currently higher than before Notley became Premier of Alberta. Will this effect last until the fall? Probably not. But I'm sure Mulcair isn't against the spotlight. I mean, just a couple of months ago, the NDP seemed more likely to fall back under the 20% mark and simply fight for third place. Given his huge advantage in Quebec (where it can lose quite a lot of votes and still win the most seats, thus insuring Mulcair will keep a respectable caucus size no matter what), the NDP now appears in relatively good position to at least start the next campaign with the objective of winning it (or at least, they can aim for this objective without looking silly). In term of projections, here there are. Remember that the seat intervals as well as the chances of winning are estimated using 5000 simulations that account for the uncertainty of polls as well as f the electoral system. The detailed projections are here. You can make your own projections using the simulator. However, the model I use for Quebec and Ontario is slightly different and I'll udpate the simulator by the end of the month. The CPC would still be favorite thanks to a better vote efficiency. And it is the very definition of a three ways race with even the Liberals having a shot at winning the most seats (it'd however require a significant underestimation of this party in this poll). If the outcome of the next election is indeed close to this (assuming the CPC winning slightly more seats), you can bet we'd have a hard time deciding who would really be the PM. Stephen Harper would most likely try to stay but I'm very skeptical he could pass the Throne's Speech. At the same time, both the NDP and the LPC have said no coalition... In any case, this would be such a complicated situation that anyone telling you they know for sure is either delusional or lying. There is no scenario where either party gets a majority. The maximum number of seats is 151 for the CPC, 140 for the Liberals and 159 for the NDP (yes, the NDP has a higher maximum). See these numbers as the absolute best case scenarios for each party. We're are talking about a situation where the party would out-performs the polls significantly AND have an efficient vote. Bottom line: with numbers like these, no way anybody gets a majority. As I've said, it's one poll and it's doubtful the bump for the NDP will last 5 more months. But right now, Thomas Mulcaire is definitely in a much better situation than a couple of months ago. On Tuesday, history will be made in Alberta. The NDP of Rachel Notley will form the next government of this province while the long-term incumbent Progressive Conservatives will suffer a dramatic loss. Let's go straight to the projections (for those of you who are impatient) and let's discuss the details after. Remember that you can use your own numbers in the simulator. (Note: I'm posting this Monday morning as I don't expect any more poll. If we do get new ones, I might update the numbers but quite frankly, it won't affect much as the new numbers would be averaged out with many others). The NDP has a 96% chances of winning the most seats. While it's slightly less than the 99% the Quebec Liberals had in last year's election (that they won easily), this still represents an absolutely massive lead over the other parties. This is way more than the chances the Ontario Liberals had last year (around 80%) and also significantly more than the chances the BC NDP had in 2013. So let's put it differently: if the NDP doesn't win the most seats tomorrow, this will be a bigger surprise than when Christy Clark won the BC election. I can't compare to the chances the Wildrose had 3 years ago as I didn't have a projection model for that election, but I have a feeling the Wildrose wouldn't have been at 96%. Maybe I'm not being clear enough here: if the NDP doesn't win tomorrow, this will be without a doubt the biggest failure by the polls I've ever seen in a general election. Ok so we actually got three new polls yesterday, including a last minute Forum one with data collected on May 4th. Say what you want about Forum, but these guys poll every single election and they always try to do in the last minute as well. I for one appreciate this. All three polls have the NDP clearly first, around 43-44%, so higher than my projections here. If I was to include these polls into my average, that would increase the NDP slightly (to 40.4%). So not enough to motivate me to redo everything. I therefore stand by these final projections. Of course, if we were to only use the polls done very recently, the NDP should be higher (around 42-43%) while the PC would fall to 25% (still allocating more undecided to this party, see below). Using the average of the last 3-4 days only, the NDP would actually sweep almost all of Alberta and could win as many as 70 seats. The PC could be wiped out completely, including in Calgary. So why don't I use only the most recent polls? After all, it'd make sense since they are the most up-to-date. My problem is that most last minute polls are from firms who had the NDP higher during the campaign already, namely Forum and Ekos. So when I see these two firms showing us the NDP as high as 45%, I'm not sure if they are truly picking up the trend in these last days of the campaign or if we are simply observing some house effects. So I wouldn't want to include only these polls, despite Ekos doing pretty well in the last Ontario and Quebec election. I still believe it's likely the PC will out perform the polls (again, read below if you haven't already). And I think it's unlikely to have the NDP sweeping Calgary by winning most of the close races. Still, the polls were already pretty clear before, they are even clearer now. If the NDP doesn't win today, they won't be able to use the excuse of a last minute change of mind of the voters. By the way, I always find it odd when every single poll shows us the same numbers. The last 5 polls have the NDP at 45, 42, 44, 42 and 44. This is incredibly similar and quite frankly, a little bit too similar. If the samples were truly random, we should see more volatility with sample sizes this small. 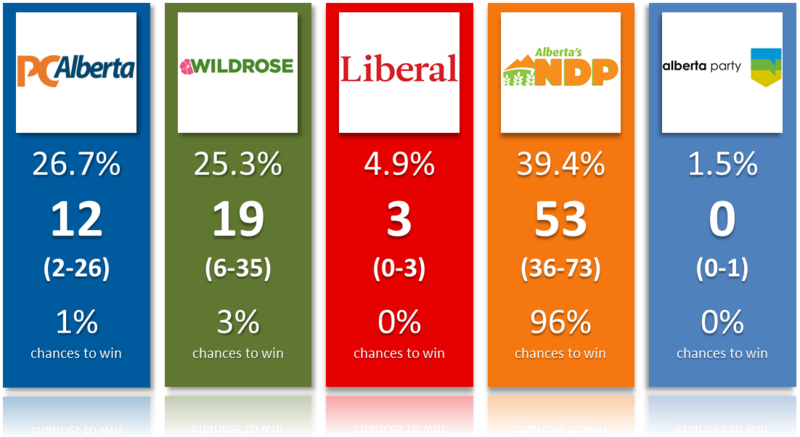 At the end of the day, the NDP will win a majority today, as projected yesterday already. Whether it'll be with 50 or 70 seats is a little bit up in the air. As usual, if you don't like my poll average, then just use your own numbers in the simulator. But the projections and analysis here and below still stand. We got our fair share of polls in this last week. And they all agree: the NDP is clearly ahead. With that said, I do adjust these polls slightly when averaging them. For starter, I don't allocate undecided proportionally (which is equivalent to just ignoring them). For instance, the Liberals and Alberta Party don't get any undecided. Polls tend to overestimate small parties and this is my way of taking care of that. Also, the Alberta Party and the Liberals don't run a full slate of candidates. The AP in particular only has 36 candidates! Yet the polls don't take that into account. So you have people who answered that they'd support the AP candidate but they'll find out on Tuesday that there isn't any in their riding! So I adjust province wide as well as at the riding level (specifically, whenever there isn't a Liberal candidate, I redistribute a bigger share to the NDP). Finally, I have the PC higher than the polls because I allocate more undecided to this party. Why is that? Multiple reasons. First of all, the PC has been underestimated by the polls quite often in the past. They also are the incumbent party and this usually means being underestimated by the polls. Finally, the PC is just a machine in Alberta to get the vote out. Also, the PC is polled higher among older voters and they usually get out to vote. That will not be enough to win on Tuesday but it could save a couple of seats. The result of all of this is that I have the PC slightly higher than if you simply average the polls. And logically I have the NDP a little bit lower. But I don't adjust in such a way that I believe the polls to be absolutely wrong like they were in 2012. Mostly because the trend has been different with the NDP actually picking up steam at the end. Also, polls show that most people in Alberta somehow expect a PC victory. Either Albertans don't follow my site (what a shame) or they are being so used to the PC winning that they can't picture anything else. For the NDP, this is actually a good news as it means its voters won't be complacent and stay at home. The bad news is that undecided could go with the PC as they usually go with the party that can win (on top of representing the continuity). The most recent election we have had was in Ontario last year. The polls did relatively alright but only if you looked at their regular numbers, not the likely voters (which had the PC much higher and the NDP too low). It seems the polling firms have learned their lesson since they don't have LV models this time around. I'm quite happy with that. Transposed into seats, these numbers paint a very clear picture: the NDP will win the most seats by far. And a majority is also likely (80% chances). You have the detailed, riding by riding projections here (which include probabilities in every riding). The NDP is polled ahead in every region of Alberta, including Calgary. Its lead is obviously more important in Edmonton (and the model accounts for that in its calculation of the swing). In this city, there is absolutely no race and the NDP will sweep it. Out of the 19 ridings with Edmonton in the name, all are projected to go NDP. 13 are even projected with a level of confidence of 100% (and my model has never made a wrong call in this case so far, even when the polls were wrong like in BC or Quebec). Calgary is by far the most interesting battleground this Tuesday with all five parties in position of winning seats (well only on for the Alberta Party). Out of the 25 ridings, 18 are close races (winning by less than 5 points). And many are actually three way races. This will be very interesting. Make no mistake though, the Calgary battleground will only decide whether the NDP could win as many as 70 seats or if the PC gets 20 seats or zero (yes, there is a chance the PC could ultimately win no seat at all). It'll not ultimately decide the color of the government (because again, the NDP will win unless we have a major failure here). The Liberals should keep their 3 seats but we never know and the orange wave will not wipe them out. As for Greg Clark in Calgary Elbow, he definitely has a chance. In the rest of the province, this is essentially NDP vs Wildrose. The fact the PC is not in the race in most of the rest of Alberta explains why the projections have this party finishing 2nd in term of votes but third in term of seats. Another beauty of our electoral system. Speaking of which, I believe the NDP is in favor of electoral reform. This election will test their commitment to that (update: it doesn't seem the Alberta NDP is officially in favor of PR. My bad). If they really go ahead and introduce some sort of PR after having won most of the seats, I'll be pleasantly surprised by a party finally not changing its mind once in power. The real race tomorrow is for 2nd place. 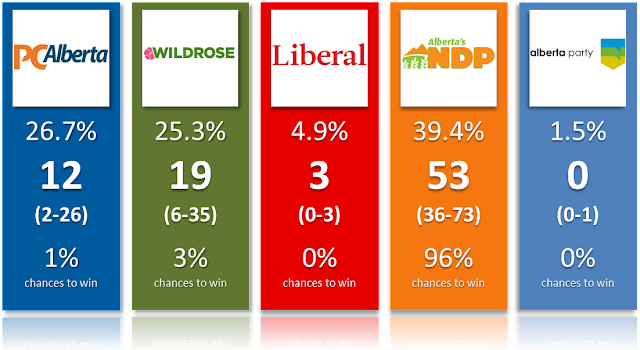 The Wildrose is projected to finish 2nd (in seats) about 75% of the time). Still, some people believe a late swing for the PC will actually push them to victory in a couple of ridings. I have seen nothing in the polls to really sustain this and I already have the PC higher than the polls. So possible but unlikely. Finally, outside of Edmonton, I believe there is no riding where the projected winner is given 100% confidence. This mean that while the overall result doesn't leave much uncertainty, we could still have surprises here and there. We also need to realize that the swings for the PC and the NDP are never seen before. It's more difficult to predict what will happen when we are in a situation with the NDP at 40% when this party was below 10 last time. When major adjustments like these happen, expect a few surprises, including in ridings nobody thought the PC could lose (or the NDP win). So why aren't my projections showing a 100% chances of winning for the NDP? Is it because I'm too scared to commit? The answer is no. I have ridings with a candidate at a 100% quite often in my projections (and I've never been wrong in these cases after 4 elections, including the massive polling mistake of the last BC election). It's just that I account for a lot of uncertainty. First of all, I know the polls are not infallible. Technically, if you simply average the polls of the last week, you'd be left with very small margins of error since the theoretical sample size of 6-7 polls is huge. However, I acknowledge polls have other sources of uncertainty outside of the classic sampling variation. Pollsters have different methodologies (questions asked, how the data is collected, weights, etc). On top of that, past elections have shown us polls can have systematic bias for or against a party. 3 years ago in Alberta, the Wildrose was systematically overestimated. Same for the NDP in BC. The Liberals in Quebec in 2012 were systematically underestimated. In other words: the actual margins of error are much greater than the reported one. I got the chance to use Abacus data from the last Alberta and Ontario elections and they had this very interesting question where people were asked to rank (from 1 to 10) their likelihood to vote for each party (as opposed to simply choosing one option). Using this data, I ran simulations where I looked at what could have happened had parties "converted" this potential support differently. For instance, one third party (like the NDP in Ontario) could have a lot of people saying they "could" vote for it, but then very few among them would ultimately choose this option. And this is really an important thing to understand: measuring voting intentions is very different from measuring (say) the average age of a population. With age, some people can lie for sure, but they can't be unsure, they can't change their minds. With voting intentions, they definitely can. So we need to account for that by having margins of error bigger than the 2-3% reported. For Alberta in 2012, my simulations showed that the Wildrose was actually more like between 30 and 45%. On the other hand, the PC could be as high as 40% (notice that while these "enhanced" margins of error could indeed have predicted a PC win, this party was still systematically underestimated and we still don't know why. Pollsters who simply said people changed their mind are using a cop-out. It's not that simply). All that to say that while the polls have the NDP around 40% in average, this party could actually be significantly higher or lower on election day (and people need to stop thinking the uncertainty only goes one way. If you acknowledge that the NDP could be overestimated, then it could also be the opposite. Just ask the Liberals in Ontario). My simulations fully account for that. I even have extreme scenarios where the NDP would get only 32% of the vote for instance, but these cases are of course rare. Modeling the uncertainty is actually more interesting to me than the simple number of seats. Sure, most people will focus on them but the fact is that there is uncertainty and luck involved. The model also accounts for the uncertainty due to the electoral system as well as the distribution of the vote. The NDP could get 40%, but be very inefficient by having most of these votes coming from Edmonton (and thus not translating into as many seats as predicted). So I account for this second source of uncertainty. All this process makes it such that out of 5000 simulations, I pretty much cover every possible scenarios given the information we have at hand (past election results, polls, etc). And this is why the Wildrose is given 3% chances of winning the most seats. It's possible (this party would need a very efficient vote as well as a serious underestimation in the polls), but unlikely. Same for the PC to an even greater extent. In conclusion, based on all the information available currently, there is no doubt the NDP should win on Tuesday. And this party should even get a majority. As I've said, if the NDP doesn't win, the pollsters will have to answer to a failure far greater than what we saw in Alberta and BC.